I've written a book! It is a tried and tested guide for everyone at the very beginning of their knitting lives, looking for guidance and patterns for projects that they can use to make that first all-important step to 'Beyond the Scarf'. Feel free to download this sample Baby Booties pattern from the book! 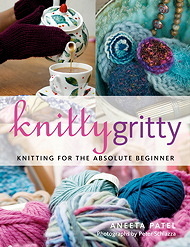 Knitty Gritty is available to buy directly from myself at the RRP £14.99. You can pick up a copy at one of my knitting classes or I can post you one (+ £4 recorded delivery p&p within the UK). If you wish I can also write a message and sign it inside! Just contact me and I'll arrange for you to receive a copy. So far more than 180 readers have been kind enough to leave a review of Knitty Gritty on Amazon. The average rating is over 4.7 stars out of 5! Here's the first review left which I'm obviously very fond of! "My absolute favourite knitting book!!!" • "Excellent beginner's introduction" • "I learned to knit thanks to this book!!!!!" • "Perfect for Beginners!!" • "A must for any beginner" • "At last, it all makes sense!" "This is one of the best beginners knitting books I have ever seen." "Full of absolute beginner-proof instructions and patterns. The must-have accessory this winter." "This comprehensive resource is a must-have for the new generation of knitters." January 2012 update: Another print run of 5000 copies! September 2010 update: Just heard from A&C Black today that the 4th print run of Knitty Gritty is on it's way! That's a total of 12000 Knitty Gritties! : ) A Big Thank You to everyone who's helped make it a success. 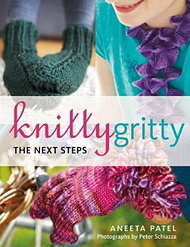 April 2010 update: KNITTY GRITTY NOW BACK ON SALE!!! Here's the Amazon link that will earn me a few exta pennies if you buy the book via it. Signed copies still available from me if you email me direct. Errors and corrections to the 1st edition of Knitty Gritty.